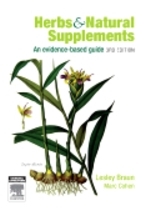 Herbs and Natural Supplements: An Evidence-Based Guide 4th edition presents evidence-based information on the most popular herbs, nutrients and food supplements used across Australia and New Zealand. Organised alphabetically by common name, each herb or nutrient listed includes information such as daily intake, main actions/indications, adverse reactions, contraindications and precautions, safety in pregnancy, and more. > provides current, evidence-based information on herbal, nutritional and food supplements used in Australia and New Zealand. > user-friendly, well indexed, and organised by A-Z herbal monographs, making information easy to find. > appendices offer important additional information for the safe use of herbal and nutritional supplements, including a list of poison centres, associations, manufacturers plus much more. > clear and comprehensive tables including Herb/Natural Supplement – Drug Interactions and Pharmacological Actions of all Herbs and Natural Supplements listed > a glossary of terms. > NEW - unique and comprehensive chapter – Complementary Medicine and Pregnancy. > chapter 6 re-named Introduction to the Practice of Integrative Medicine. > All chapters completely updated and expanded. > 10 NEW monographs to be added to the existing 120. arginine; rhodiola; shatavari; prebiotics; elder; taurine goji; acai berry; mangosteen.